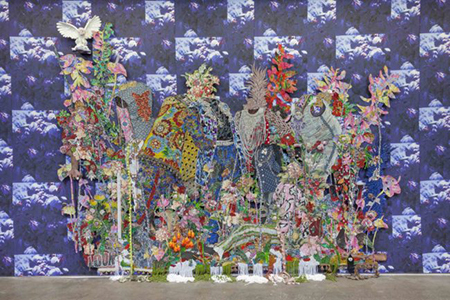 A rich, printed fabric wallpaper of wilting flowers covers the gallery walls from floor to ceiling, its deep blue and matte surface absorbing light, making Ebony G. Patterson’s exuberant assemblages installed upon it even more lustrous through contrast. The Kingston, Jamaica and Lexington, Kentucky-based artist continues with her signature aesthetic of cut-out fabric, glitter, plastic jewels and faux flowers, the masses of colors and patterns functioning as to both lure us in and partially disguise the content to be found within them. The political and deeply emotional work in “…for those who bear/bare witness…” addresses the violence perpetrated toward individuals and communities who are also systematically silenced. In “...she saw things she shouldn’t have...for those who bear/bare witness,” a headless, limbless torso in a tutu can barely be discerned in the midst of hanging tassels, cartoon animal appliques and bodiless, printed fabric legs and arms. The distinguishing characteristics of this piece include gold plastic pirate coins, gilded conch shells, and a colorful, fabric-covered toy gun leaning against the bottom of the work. This latter component amplifies the piece from unsettling to traumatic, as it immediately calls to mind the all-too-familiar incidences of children murdered by police, Tamir Rice, in particular. In this work, and throughout her exhibition, Patterson uses a combination of realism and metaphor to illustrate the loss and fracture experienced by those who live with the aftermath. This combination of grief and ornamentation, the flowers and the everyday objects, makes each vignette feel like a memorial. Indeed, “...in loving memory...for those who bear/bare witness,” in which the headless body of a man with his hands in his pockets and his back to the viewer, itself sports a funeral wreath. While the figures in some pieces, like the ones described above, appear rather abstracted, in others, they’re more narrative. The two male bodies in “...they wondered what to do...for those who bear/bare witness,” flashily dressed in layers of brightly patterned tunics, vests and boots, lean in towards one another, as if in conversation. “...fraught...for those who bear/bare witness” features a woman’s bright blue braid rendered in woven photo tapestry amongst perhaps the single example of an individualized face in this exhibition: a young girl with a shy smile. Altogether static and absent, active and present, Patterson’s work in “…for those who bear/bare witness…” embodies a wide swath of experience in one way or another linked to this pain. Described by the artist as a “nocturnal garden,” this is a place where life and death are intimately linked to complex, often distressing effect. Looking past the delights of the flora in the sunlight, this exhibition reveals what else is happening under cover of darkness.